Running a Panel: Last year I led the Core Conversation “How To Not Be A Douchebag at SXSW” with Violet Blue and John Adams. This year I resubmitted the idea and SXSW decided it should be a panel. 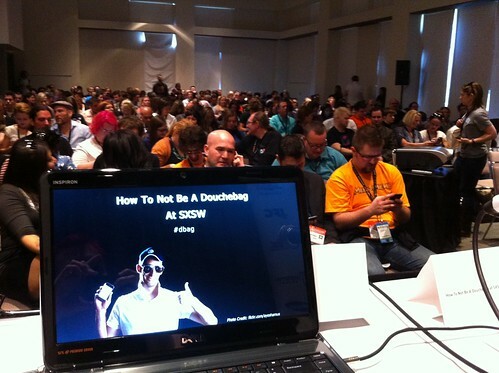 So along with John Adams, Scott Beale of Laughing Squid, and Amber Osborne (aka Miss Destructo) we taught a packed room of mostly first-timers how they can avoid being a douchebag at SXSW. Overall it received a very positive reception, and I didn’t see too many people sneaking out of the “at capacity” room. If you missed the panel, SXSW was nice enough to record it. You can listen to it on the SXSW site, download it here, or listen below. The Austin Chronicle has a summary with some quotes. Methodshop, KMP Blog, and Curiosity have write-ups as well. Attending Panels: Once again I didn’t make it to too many panels this year. I’ll be honest, part of the reason was the late nights out with old and new friends. Getting up and out of the hotel before noon was a bit difficult most days. The time zone change and the Daylight Saving change didn’t help. As such I missed quite a few early morning panels that I really wish I could have made it too. One other hurdle for making it to panels was that they were so spread out. I didn’t attend any panels that weren’t in the Convention Center or the Hilton. I understand the want to have more panels available to the steadily growing SXSW Interactive crowd, but I was sad to miss a number of friends’ panels just because they were scattered or double-booked. I quickly stopped even bothering to look at venues other than ACC/Hilton when I wanted to go to one. I don’t have a solution, this is just my experience and the similar sentiments I heard from others. Hotel: My first time at SXSW I stayed at La Quinta Inn Oltorf because I decided to go at the last minute and all the other hotels were booked. That was terrible, don’t do that. 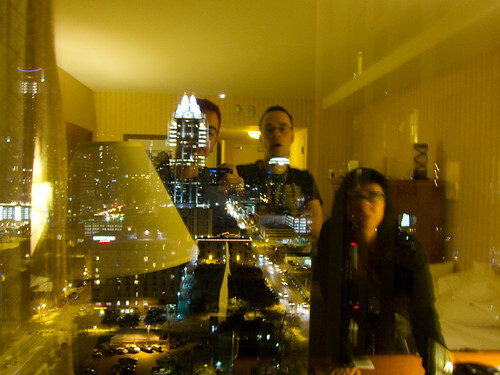 Last year and this year I split a room with friends (@violetblue, @dotben and @ekai) at the Hilton, which was awesome. Splitting the room four ways (two beds and a roll away bed) made the room more affordable as well as more fun. This Hilton is also right next to the Convention Center and also has panels in its own building. Definitely the most convenient place to stay in my opinion and I’ve never had any problems with service or accommodations there. 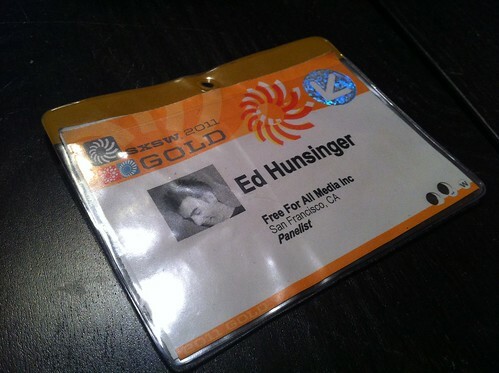 Badge: I got a Gold badge again this year because I was a panelist. Last year’s Gold badge came in handy because I got a chance to attend the screening of Objectified. This year however I didn’t make it to any films. With so much to do and so many people to spend time with I didn’t want to wait in line for a movie that may or may not be enjoyable. I wish it was easier/more convenient to see films. If I had to buy a badge, I’d go with an Interactive only badge in the future. 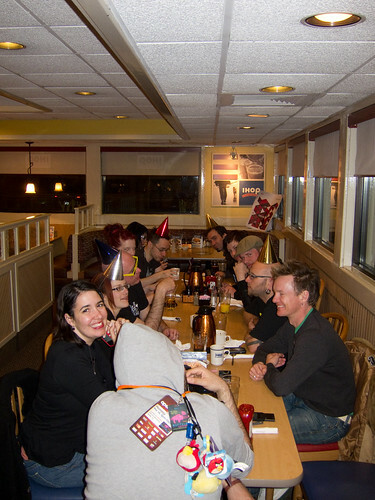 We also had several people in our group that didn’t even have a badge and most times that wasn’t a problem except for a couple of SXSW-only parties. 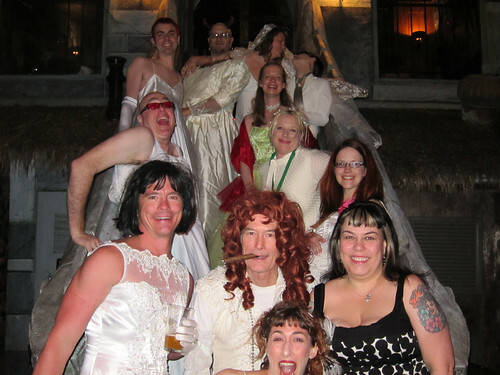 Parties: We went to quite a few parties this year as well as created our own. At the SapientNitro party (at Venue 222) DJ Spider was awesome and we played the Primal Scream Game (get people to give their best primal scream). The ACLU/Google party at Maggie Mae’s was a fun 80’s themed party where Amy was given the challenge of collecting 13 silly straws (she completed it). Five or six of us won free Timbuk2 bags from the WatchDotTV people at the Mashable party at Buffalo Billards and then we caught Eclectic Method. And then there was the Twitter party at Icenhauer’s, which was one of the few parties I actually waited in line for since it was packed and I wanted to see friends inside. It was worth the wait. The gdgt party at Purevolume was kind of a joke, as it was “RSVP only” and after cashing in my +5 RSVP we found out it was basically a trade show. A couple free beers and a free iPhone case and we bailed, but not after taking over a table and attempting to find investors for Spacerack (more on that later). Sadly, I missed out on all the parties at the Seaholm Power Plant which I thought would be a cool venue; next year perhaps. Monday night was the 2nd Annual Revolving Door Party in the Hilton’s revolving door. Matt scored some great party supplies (hats, noisemakers, glowsticks, and even stamps for the door). It was much shorter than last year’s party but was very crowded. While we partied the annual foursquare Hilton lobby backstroke competition went off. People: I met so many new people and got to spend time with a lot of old friends over the course of SXSW. Now would be the time to list of all of them, but I don’t know where to start and where to end. To all the people that I met and spent time with at SXSW whether it was at a panel, hitting some tech party, bouncing around to random bars, having lunch/dinner together, running around in a wedding dress, late night food adventures, or at a BBQ, thank you for making SXSW an awesome event and one I look forward to returning to next year. In the end it’s all about the people.